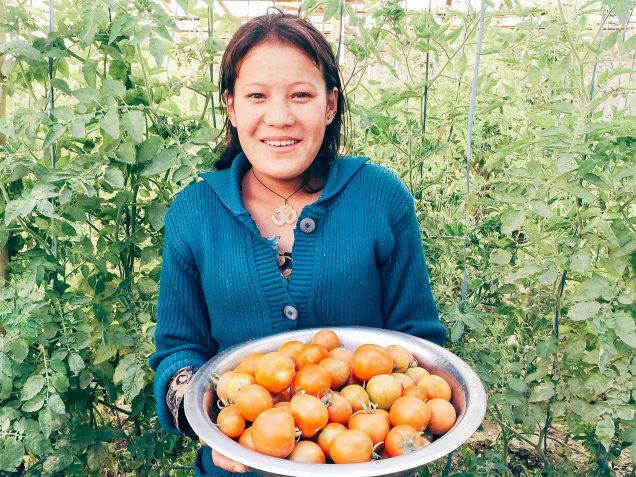 Photo: Innovative improvements to our garden project at the ‘She Has Hope’ rehabilitation home were a huge success, providing an abundant organic tomato harvest. Today we bring you news from our native team in Kathmandu, who have been severely affected by an economic blockade unofficially imposed on the people of Nepal by their neighboring country of India. They are now 5 months into protests that have blocked the main points of entry for goods from India, such as fuel, cooking gas, and vegetables, thus leading to crippling shortages of these items in Nepal. The crisis can be traced back to early August, when residents of Nepal’s southern plains bordering India, who are known as Madhesis, began protesting provisions of the country’s new constitution. The Madhesi groups are unhappy with the way the new constitution demarcates states, saying that it will leave them underrepresented in the federal government. They want all plains districts in southeastern Nepal combined into a single state. 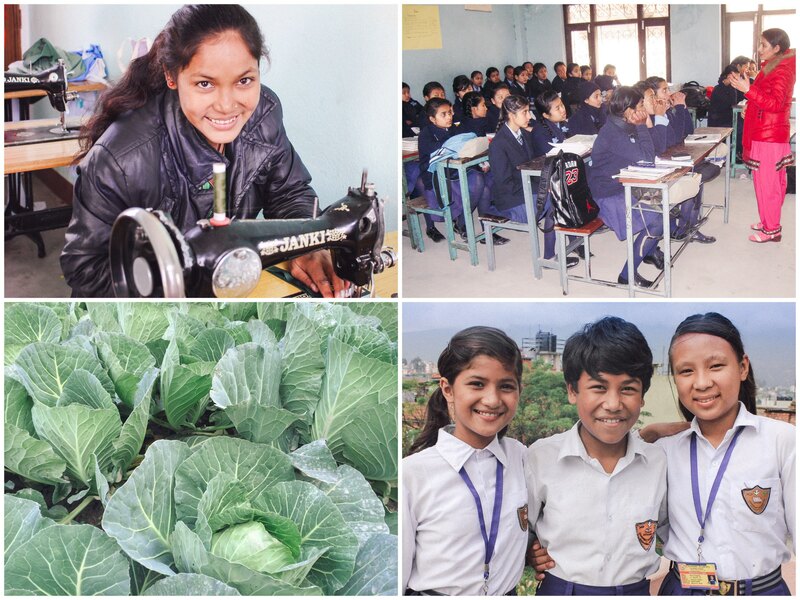 Photo inset: (Top-left): Our rehabilitation program teaches girls to become proficient in seamstress skills, as well as gardening and craft making skills. (Top-right): Our native team continues to provide trafficking awareness classes to local Nepali girls. (Bottom-left): The garden at our rehabilitation home provides a source of nutritious food for our native team and beneficiaries of our programs. (Bottom-right): These girls from our orphan home are thankful for the opportunity to obtain a quality education. In the midst of this crisis, we are happy to report that our garden at the ‘She Has Hope’ rehabilitation home is flourishing, thus we have been able to provide the girls and our native team with nutritious, organic meals during the economic blockade. We are growing cabbage and cauliflower, which we will harvest this month. Our garden produce is in addition to our off-site farmland which is currently growing spinach, garlic, and onion to be harvested in March. However, our garden at the rehabilitation home provides us with quicker access to food, which has proven especially true during the blockade. We also had a successful tomato harvest at our rehabilitation home this month — we sold 13 KG of tomatoes, earning a small profit at market as well as providing the girls and our children with fresh tomatoes to enjoy with their meals. Tomatoes are high in vitamins A, C, and K, as well as significant amounts of vitamin B6, folate, and thiamin. Tomatoes are also a good source of potassium, manganese, magnesium, phosphorous, and copper. All of these vitamins and minerals give our girls and children the wonderful health benefits of improved eye sight, good stomach health, and reduced blood pressure, as well as relief from diabetes, skin problems, and urinary tract infections. In other good news from our off-site farmland enterprise, we sold 6 goats at market, earning $200, which will enable us to purchase children’s books for our orphan home library. Our goats are valuable assets as they are raised for stockbreeding and can provide nutritious milk for the children as well. Surplus from the farmland is sold at market to generate much-needed funding for our programs such as ‘Children’s Hope Center’ slum outreach, our orphan home, and our human trafficking prevention, rescue and rehabilitation programs. With your support, we hope to expand our farmland project in the future, to further our work of growing toward sustainability in Nepal.